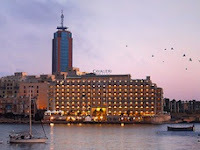 The Cavalieri Hotel in St. Julian's (map) will be hosting our next Saturday Milonga on 6th August, from 8.30pm - 11.30pm. We will be in the lobby - on the right from the reception. Tango music will be provided by DJJJ. Please email your music wishes to Jelena . Fee is 3€, please pay the tea pot. For more info please contact Nathalie.